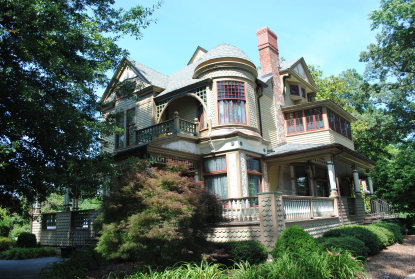 On December 21, 2000, descendants of the Harper family arranged for the acquisition of the 1887 Queen Anne-style Shuler-Harper House in Hickory by the Catawba County Historical Association in order to ensure its future preservation and to serve as a museum and cultural center for the community. Following a successful fundraising effort, the house was fully restored. The restoration highlighted its picturesque and highly decorative exterior design and exquisite interior finishes. The house was built for local banker David Webster Shuler, and would ultimately be used by six other families, including three generations of the Harper family. Owner of the Harper Motor Company, Finley Gwyn Harper Sr. purchased the house in 1923 and through the years family members valued and preserved the residence’s impressive architectural design. The Shuler-Harper House stands out as one of the state’s finest Queen Anne-style houses with its fanciful exterior walls, round corner tower, multi-gabled roofline and inviting wraparound porches. The interior features latticework archways, richly hand worked mantels, paneled wainscoting, stained glass, parquet floors and an ornate staircase. Check out the State Historic Preservation Office website and Facebook page for more information on our state’s rich preservation legacy.